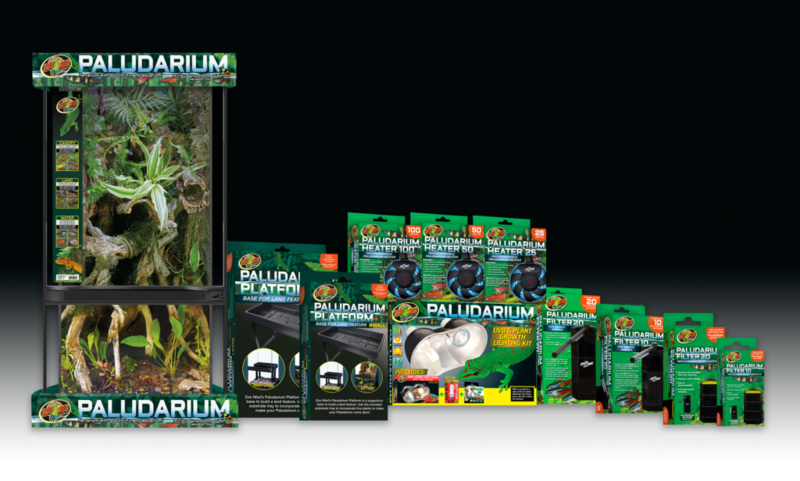 Zoo Med Laboratories, Inc. introduces their new Paludarium Line. via Zoo Med Laboratories, Inc.
Paludariums are a window into nature that fit perfectly in your home or office. Blending together a nano aquarium on the bottom and a terrarium on top, paludariums build a home for reptiles, fish, and plants to live in harmony. Fish and aquatic plants soak in refreshingly clean water with the submersible Paludarium Filter that keeps up to 20 gallons of water pure from dirt and debris. Accommodate tropical species of aquatics by adjusting the water temperature anywhere from 68-93°F (20-34°C) with the Paludarium Heater. For your landlocked life, place the Paludarium Stand in your habitat and effortlessly assemble up to 22 pounds (10 kg) of greenery to maximize the distance your arboreal pets can roam in their habitat. Top your enclosure with the Paludarium UVB & Plant Growth Lighting Kit. It comes with an LED light to stimulate the growth of live plants and enhance the colors of your reptiles, and a UVB light for animal health. This new line of Paludarium products can be used in either of Zoo Med’s Paludarium Enclosure sizes: 12”x12”x24” with a 4-gallon water feature or 18”x18”x36” with a 10-gallon water feature.